The Rama Krishna Mission Blind Boys' Academy (RKMBBA) has been an Award Special Project since 2002. RKMBBA transforms lives of visually challenged young boys. Rupanjan- Award Leader at RKMBBA describes the impact of The Award very candidly, "Life was under dark shadow before The Award came to the boys to them. With IAYP, a new ray of hope entered their lives kick-starting a new journey of self-realisation. Ever since, the young boys have challenged students the ups and downs of their lives boldly, imparting their courage and leadership to their fellow students and proving that they have a place in society in a very different way!" The recent success of 19 visually challenged boys from 2nd to 5th May 2012, at their Adventurous Journey in Panchalingeswar, Orissa, organised by the Institute of Climbers and Nature Lovers (ICNL) was 'empowering' for everyone! DAY 1- The 5 instructors from ICNL, encouraged the boys to learn the formation of different rocks and mountain and different techniques of free climbing, exploring hand hold, foot hold, etc. They also learnt how to keep body balance on a rock face. In the evening session, the theoretical classes taught the boys how to survive in a 'do or die' situation, the symptoms and remedies of mountain sickness. 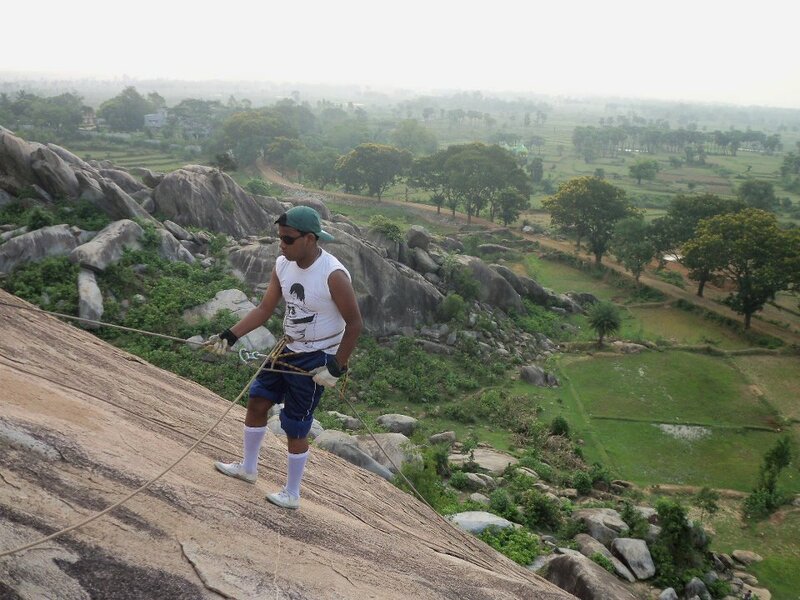 DAY 2- The first session was started at 5.10 am with the students going to a huge rock face for rappelling training. It was a fabulous experiences to them. They were not scared to descend from the high altitudes, in spite of their visual disabilities! Post breakfast, the session session was a class on knots and equipments. They learnt all about the different types of knots like end-man knot, bowline knot, clove-hitch knot; in addition to learning about carabiners, figures of eight, different types of ropes and how to pitch a tent. This session proved to be very informative, the boys were proud to touch and use the equipments because they knew these equipments are used in different expeditions even for Mt. Everest. This session was followed by a short trek to Panchalingeswar Temple. On top of the hill, during the trek, there was a violent thunder storm and we (the instructors) were surprised to see that none of the boys were scared (like they normally are). This is The Power of The Award. Young People learn to overcome their fears, learn new things. The day ended with one of the ICNL instructors recounting his Mt. Everest Climbing Experience, where he shared his valuables thought and memorable moments of climbing Everest. DAY 3- The next morning, the boys woke up at 0530 hours for an altitude gain session where they climbed around 2000 feet without ropes, on a hill that is a free sanctuary for elephants and bears. The ICNL Instructors showed a few signs left behind by the elephants and bears and the boys enjoyed this tremendously. The 2nd session comprised of practical training, where the instructors hung different rope bridges and the students successfully completed their allotted task in time. This followed the 'most interesting training' where they climbed a wall with the help of a Jumar. The afternoon session began with a trek of about 5 kilometres to get to a river dam surrounded by hills. On their arrival at the dam, they interacted with the local tribal and shared their love for the nature to them. The Silver Level Adventure Camp ended with a Gala Camp fire, display of remarkable music skills byt the boys ,recitation, mimicry and even dance.